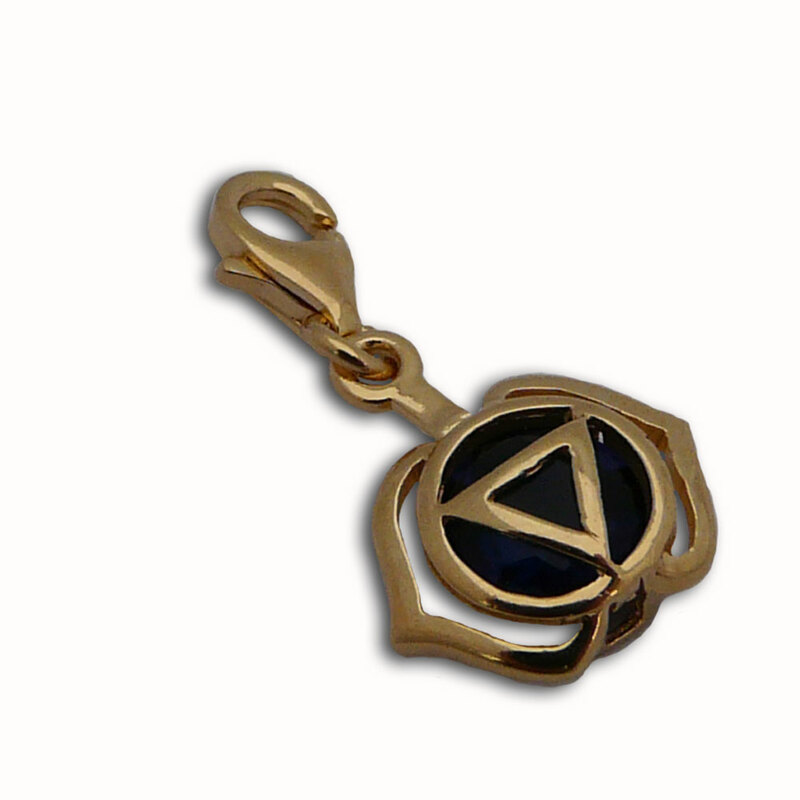 CH725g Gold Vermeil Forehead Chakra Charm with sapphire colored stone. The third-eye chakra charm has a spring clasp so it can easily be added to your existing necklace or to most of our necklaces to make your own forehead chakra jewelry design. It is part of our charmas, good karma charms collection and can be combined with the other charms to personalize your jewelry. 18k gold plated over sterling silver. Made in Thailand. Sterling silver Forehead Chakra charm bead with sapphire colored stone. The third-eye chakra bead represents intuition, wisdom and insight. The opening of the bead is 4.5 mm and it has a rubber stopper. It is compatible with Pandora and other 3 mm chain charm bracelet systems. Forehead Chakra Charm with sapphire colored stone. The third-eye chakra charm has a spring clasp so it can easily be added to your existing necklace or to most of our necklaces to make your own forehead chakra jewellery design. It is part of our charmas, good karma charms collection and can be combined with the other charms to personalize your jewellery. Available in 2 sizes. This is the smaller size 1.2 cm. Intuition. Wisdom. Insight. Sterling silver forehead chakra pendant on a micro-fiber suede (vegetarian) blue necklace with adjustable sterling silver clasp 16-17" (40-42 cm).